Historic Wesley Center, located on the corner of Grant Street and Marquette Avenue (101 E Grant Street) in Minneapolis, is a 125-year-old testament to Minneapolis’s ecclesiastical scene of the late nineteenth century. Originally known as Wesley Methodist Episcopal Church, this Romanesque Revival building features an impressive exterior of granite and rough-hewn sandstone. The facade showcases Romanesque elements such as simplified arches, Corinthian columns, and decorative friezes. The interior decoration could be described as an eclectic orientalist design and features ornately carved wooden walls, a sweeping curved balcony supported by Corinthian-inspired columns, and stunning, non-figurative stained glass windows. Further grandeur can be found in its large suspended stained glass dome. The Wesley was dedicated in 1892, a year after construction, and was designed by local architect Warren Howard Hayes. A Cornell University graduate, Hayes was known for both his mechanical ingenuity and his signature “diagonal plan,” a fan-shaped design that allowed for community emphasis in the use of the main auditorium. The auditorium also features a large set of carved wooden doors that operate on a pulley system. When closed, they separate the auditorium from the grand hall space. To open, a large hand crank is turned in the lower level of the building. The doors separate in the middle—half rise upward into the attic space while the other half lowers into the basement level. With the doors opened, the auditorium and grand hall feel as one contiguous space that further promotes the communitarian sense of the building’s interior. The Wesley congregation was a well-known and highly respected church community in the Minneapolis area. Their outreach went far beyond church services and included programming such as theatre productions, concerts, lectures, community meals, medical clinics, sports activities, youth camping programs, radio shows, newspaper publications, and TV programs. In 1984, the Wesley building was listed on the National Register of Historic Places for the significance of its exterior and interior design, its community programming, and for its innovative engineering aspects. In the late 1980s and early 1990s, great strides were taken to preserve and restore the building. However, due to dwindling congregation size and financial barriers, the building fell into disrepair. By 2010, Wesley was listed as one of the top ten most-endangered historic buildings by Preservation Alliance of Minnesota. Soon after, the Wesley congregation ceased meeting and the solicitations for outside use of the building were made. After a range of offers were considered by both for-profit and nonprofit entities, Wesley was purchased by the stand-alone non-profit Historic Wesley Center on Grant Street with the intention of preserving the building as a nonprofit. 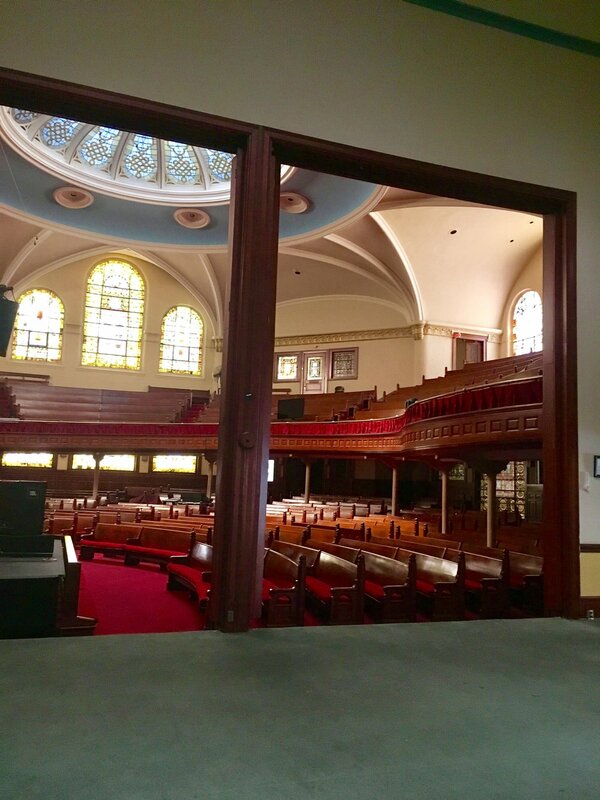 Historic Wesley Center currently uses a cooperative model of non-profit use and event space to honor the building’s community legacy while preserving its architectural heritage. Wesley is preparing to celebrate 125 years since the building’s dedication this coming May 22 to recognize the many efforts involved in preserving this historical local treasure.